The Milestone is a Victorian gastropub situated in Kelham Island, full of character and atmosphere on one of the oldest industrial sites in Sheffield. They were semi-finalists in the TV series ‘Ramsey’s Best Restaurant’ in the British category and The Milestone has been recognised in the Michelin and AA Restaurant Guides. They have also won the ‘Eat Sheffield’ best restaurant two years running. 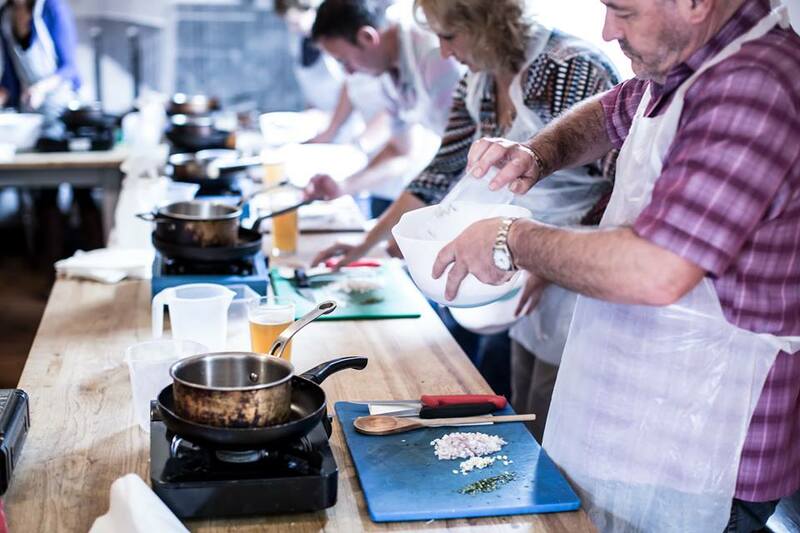 Not only is their seasonal food and service outstanding their in-house Cookery School is also something to shout about. They offer a range of cookery courses from ‘Pig in a Day’, to ‘Indian Street Food’, to ‘Advanced Bread’ and our choice ‘Sausage, Bacon and Black Pudding’. The perfect present, treat to yourself or date day with your partner. 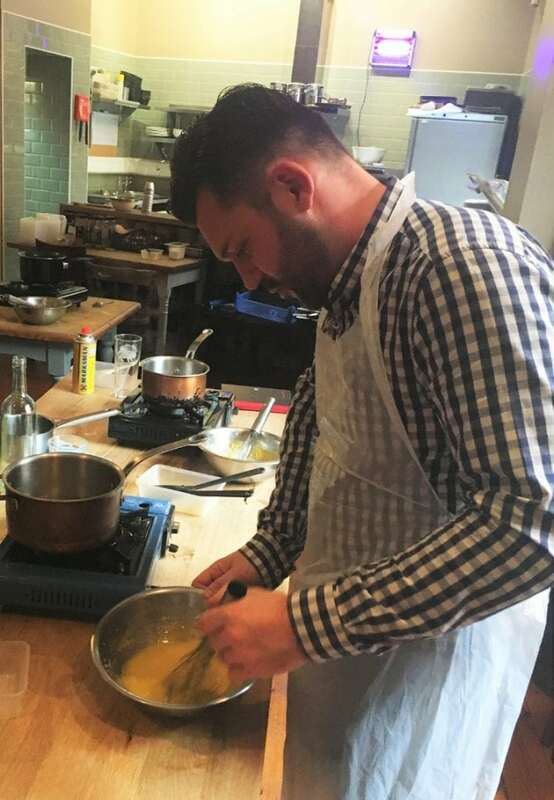 In the two and a half hour class Chef Zackery showed us how to make home-made bacon, hollandaise, sausages and black pudding. On arrival at 10.30am we started with a welcoming cappuccino whilst the chefs were setting up the cookery school upstairs. Sometimes used for pop-up events the space is intimate and quirky with characterful features, perfect for their small cookery classes. Each set up with our aprons, camping stove and utensils Zackery explained the order of the day. We started with the black pudding. With Zackery’s direction we melted butter and added chopped shallots, garlic, fresh thyme and chilli flakes. In a large bowl we added this to the dehydrated black pudding powder with some ale and then carefully whisked until there were no lumps. Writing our name on the top of each, the generous loaf tins went into the oven, ready for us to take home later. 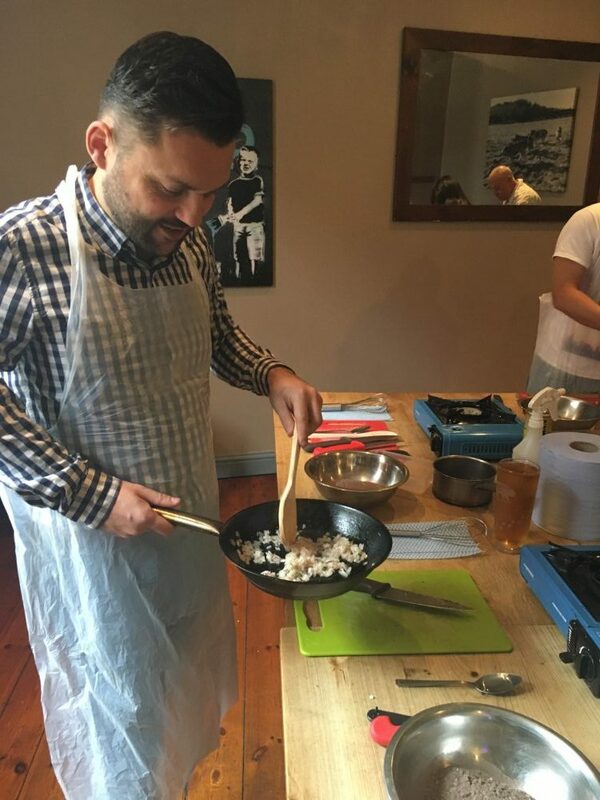 During this first dish we also learnt some knife skills with Zackery showing us how to safely cut the shallot and avoid it making us have a little cry. He also shared two great garlic tips, firstly to peel the garlic and cut the ends off, sprinkle over some table salt, crush down onto the board with the side of your knife then with the tip mash into a paste. It worked a treat! Another idea shared was to take a full bulb of garlic, cut out the root, cling film and put in the microwave for 30 seconds so you can then squeeze out the garlicy goodness! Next onto our favourite from the day, homemade bacon. We each got a generous portion of free range belly pork then added a salt and sugar cure mix and some intense smoke powder. Adding some fresh thyme and honey we then rubbed all these ingredients into the pork belly until it was placed into a vacuum bag and sealed into their machine. Zackery shared that an air tight freezer bag can also be used. Once sealed we were instructed to let it cure back home for at least 48 hours before cutting it into beautiful rashers. We were a bit intrigued about making the sausages as we imagined using a machine to pipe the mixture into the casings. Starting off with free range minced pork shoulder again showing off The Milestone’s quality of their produce, we were free to add whatever spices we wanted to from their selection of fresh and dried herbs. I opted for paprika and sage and my partner added fennel, caraway seeds and freshly chopped sage. Instead of the casing we used creppinette (stomach lining) and a piping bag to create our sausages. Zackery gave us a full demonstration before it was our turn. The hollandaise was up next which was a bit of a challenge as you must whisk until your arm goes dead to stop the mixture from splitting. Zackery showed us how it’s done before we had a try under supervision! Taking it on and off the heat, adding clarified butter and whisking like crazy. Unfortunately I needed some more practice as mine split but my partner’s was perfect. This was a really nice way to finish off the class. It was a perfect way to spend a Saturday morning. 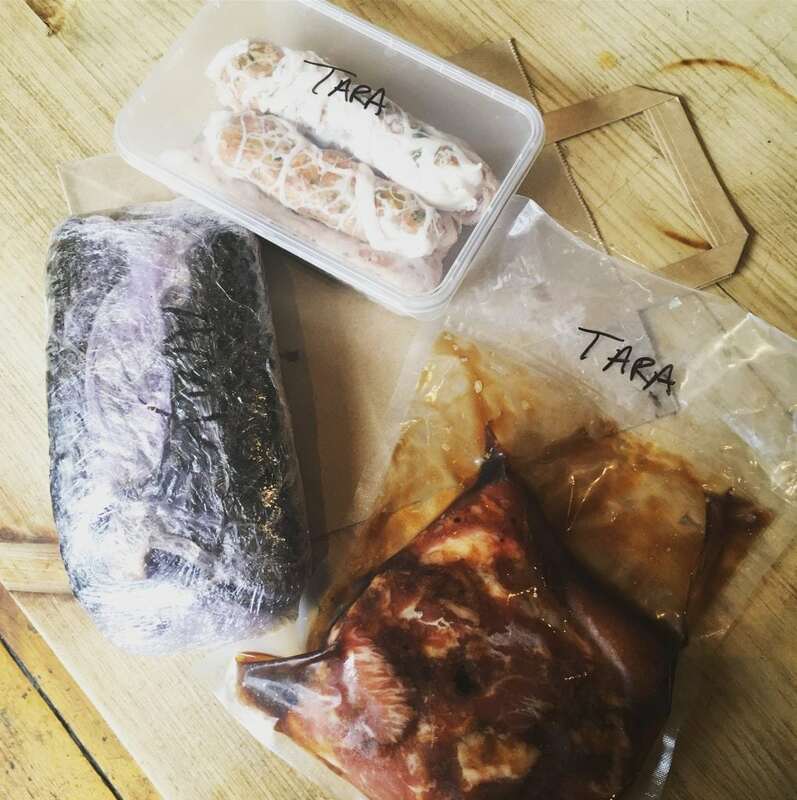 We learnt a lot and went home with our huge loaf of black pudding, homemade bacon, sausages and hollandaise. It was also really nice to see the other chefs busy in the background making all their fresh produce for the Saturday service ahead. We were also provided recipes so we could try them out again at home. Zackery was really informative and friendly, which made the atmosphere relaxed and comfortable for us to ask questions and at a pace suit to everyone. We didn’t just learn about making brunch, we also went away with some new knife skills, introductory knowledge into some of the kitchen equipment used at The Milestone and preparation tips. We’re already planning our next visit, we just can’t decide from their fantastic range of classes!